Historical fact: the trendy area in New York City known as the "meat-packing district" is still home to many streets that use these gray granite setts. These gray granite cubes with substantial flash measure 4x4x4 with one cut side. 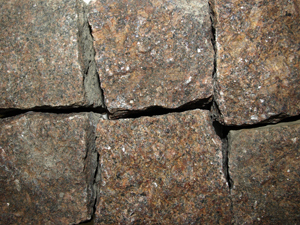 Reclaimed from the Syracuse, New York area, these gray granite setts were originally installed with a broken side up. The weathered face of this striking stone has made them a favorite of landscapers and architects.